Pair of 14 in. 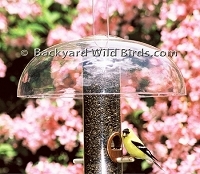 Metal Bird Feeder Baffles protect hanging bird feeders. 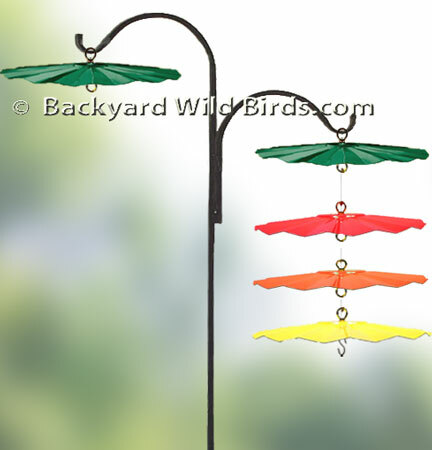 The Bird Feeder Baffles keep your bird feeders and seed dry. 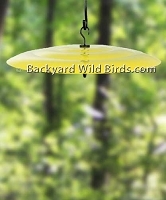 If seed gets and stays wet it can become fowled and birds will no longer come to the feeders. The metal baffles also provide some shade from the sun to protect nectar feeders. This matching pair is just right for two feeders on a double arm pole. Presents a symetrical appearance and a nice accent. Forrest green is the default color. Click the button next to the red, yellow or orange color to select that pair instead. Mounting Hardware included are two closed eyelets.